Many of my articles for this column have focused on how to get yourself to the finish line of an ultra in the most efficient and effective way. Today, I want to tackle a different dilemma: How should we recover from an ultra and, specifically, how much time should we take off from running? A common formula states that you should take one day off for every mile raced. For example, a marathoner would take 26 days off from running after race day. This well-intentioned and conservative guideline was developed to prevent burnout and injury after hard efforts. However, this principle doesn’t seem to translate to the ultrarunning world. How many ultrarunners do you know who purposely take three or more months off after a hundred-mile event? I’ll also note that many non-ultrarunners, including Olympians and world and national champions, do not adhere to this conventional wisdom. So this begs the question: Is there an individualized method we can use for determining our own post-ultra downtime? The answer to this puzzle and one that you’re likely to hear from an experienced coach or ultrarunner is simply, “It depends.” There are a multitude of factors that play into your post-ultra recovery time. Their impact will vary from ultra to ultra and year to year. Let’s examine the most significant elements that will influence when you can return to running or if you even need to take a break at all. We practice a skill or task in the hopes of becoming more proficient at it. Running is no different. If challenged frequently, year after year, the body and mind will become efficient at adjusting to and recovering from the demanding rigors we place on it. Runners who’ve accumulated countless hours of consistent training and racing time will recover faster than runners who have just completed their first ultra. Virginia’s Michael Wardian, who recently set a world record for the fastest 50K on a treadmill and is world famous for his prolific racing, put in 10 years of training and racing to get to his current aggressively-scheduled ultra calendar. 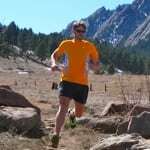 Wardian started running after graduating college and completed his first ultra at the age of 24 at the 1998 JFK 50 Mile. The race was difficult and left him battered. It wasn’t until 2008 that Wardian found his groove. “That’s when I won the 50-mile trail, 50K, and 100K national championships,” recalls Wardian. “Up to then I only dabbled in ultras because they were so tough. I got sick at a few and got lost at others. Between 1998 and 2008, I competed a lot, but my focus was on building my speed in marathons, competing in triathlons, and participating in stage races, like the Marathon des Sables and Himalayan 100-Mile Stage Race.” Whether he knew it or not, Wardian was developing his soon-to-be utilized ultra-fitness while focusing on these other events. Of course, Wardian’s situation is unique. He’s able to maintain his desire to race frequently (an element we’ll touch on later), he’s supported by numerous sponsors and a loving family, and has a career that grants him the time he needs to travel and the ability to work remotely. However, Wardian’s example proves that a mature running background can certainly alter the common recovery paradigm. Bottom Line: If you’re familiar with running with fatigue and soreness and can do so without injuring yourself, then easy running the days after an ultra is permissible. However, if you’re a newbie, enjoy your accomplishment, rest up, and take up to a week or three off before returning to some easy running. Let’s face it, the human body isn’t built like a Mack Truck. It’s a delicate piece of equipment. Athletes who are prone to injury should take a conservative approach when they return to training after an ultramarathon. Ensuring that muscle, tendon and bone are adequately prepared to resume training will pay dividends by preventing months of lost training due to unnecessary strains, pains, or breaks. If you fall into a chaotic injury pattern or experience an odd post-event niggle, then it’s paramount that you take proper precautions, namely, more time off from running. Bottom Line: Running with pain is not normal. If it hurts or if you suspect that it’s going to hurt, seek the advice of a professional and take the extra time you need to recover. Cross train (elliptical, cycle, swim) while the issue mends itself. Where there’s a will, there’s a way. But what happens when there is no will? Believe it or not, it’s quite common to find yourself burned out, fatigued, and sore after an ultra. As a result, running may be the last thing on your mind after a race. Respect these feelings. Take the time you need away from the sport to recharge. As one of California’s dominant master’s ultrarunners with PRs of 3:19 for the 50K and 14:54 for 100 miles, Jean Pommier frequently puts in back-to-back hard efforts. For example, last year, in the span of two weeks, Pommier placed third at the Miwok 100K Trail Run and won both the Quicksilver 50K and Silver State 50 Mile Endurance Run. Does racing in such close proximity affect Pommier? As inspiring as Pommier’s successive performances are, not all of us are going to want to jump back into another ultra as quickly. Simply remaining idle is a perfectly acceptable post-race activity. Bottom Line: If you are looking forward to running the day after your ultra, do it. Please take it very easy. If you’re not in the mood or promised yourself or others some time off, take it. Two to three weeks should do the trick. The training and planning you invest in before your event plays a huge role in how you’ll come out on the other side. Keep in mind, however, that overtraining is as detrimental as insufficient training and either will negatively affect post-race wellbeing. Donnelly, Pommier, and Wardian represent a rainbow of preparedness. Donnelly, Pommier, and Wardian have each found their own balanced training capacity. It’s their own individualized mix of variety, specificity, and difficulty that allows them to maintain their fitness, begin each race with confidence and finish in decent shape. Bottom Line: Smart training reduces post-race downtime. Build a resilient ultrarunner’s body by finding your own training sweet spot. Ultramarathons are unpredictable. Rarely do things go as planned and when they don’t, long days on the trail or road take their toll leaving us deeper in the recovery hole. Take a page from these consistent and talented ultrarunners by opting to skip a few days or weeks of training in favor of healing the inevitable bumps and bruises incurred on race day. Bottom Line: Ultras aren’t easy. Expect to be thrashed even on a good day. When you have a bad day, remember that it will impact your recovery. Take inventory of how you feel and take the necessary amount of time to heal before moving forward. Consider taking time off from running at the end of your racing season. A month or two away from running resets the body and mind for next year’s competitive calendar. Many ultrarunners are reluctant to take a vacation from the sport for fear of losing hard-earned fitness and perhaps missing out on an epic event. Bottom Line: Off-seasons may be unnecessary unless you have a nagging injury or are experiencing burnout. On the other hand, a break from ultra-distance races and high training volume will keep you running while recharging the proverbial batteries and providing the time necessary to improve weaknesses. Consider taking a few months to focus on shorter races, develop your speed, and build your strength and agility. There is no cookie-cutter post-ultra recovery program. Some ultrarunners get back to running the day after their race while others disappear for weeks. Successes and failures have been derived from both these recovery extremes as well as all points in between. It’s not whether we run or not, but how we interpret the cues our bodies give us after a hard, long effort that affects the quality and quantity of our post-race activity. How do you determine how long you’ll take off after an ultra? Does it vary from race-to-race and, if so, how? Do you take an off-season from racing? From hard training? From running altogether? Good article and very important topic! A one who studied exercise science I am continually impressed by the resiliency of the body and some people's absurd ability to recover (Sage, Rob Krar, some of my local friends) but I think (and this has impacted my training/racing the most lately) you forgot one huge element to recovery: work and job stress- This is definitely psychological but also physical. Even though I work in outdoor retail, I can definitely feel the fatigue of standing forty hours a week when I am trying to up my mileage- Maybe there is a formula for feet time+mileage=total physiological training load? Anyways, thanks for the article and happy trails! Don't forget quality sleep being a massive factor, too – almost certainly the biggest legal or illegal recovery (and performance) enhancer. Great article, Ian. I like the inclusion of relatively uncommon practices, such as not taking an off season. I've seen a several examples of what Pommier described, where people get hurt trying to come back from time off. In terms of continual improvement, I think the recent improvements in the men's marathon are due in part to the top runners not taking lengthy off seasons. Instead of running 2:06, taking a big break, then running 2:05 the next year, they are taking a smaller break, building off their fitness and running 2:03-04. I think another benefit to frequent racing is that it forces you to taper and recover more often. For some, including myself, I'm much more likely to get injured during a big block of training where I have little excuse to take time off and just do workout after workout. This becomes psychologically dangerous as well as physically dangerous when you only have 1 big race for the year. If you get injured or don't perform well at that one race, the post-race depression tends to be more severe and longer. I've definitely seen quite a bit of that around the Boston marathon, and 100 milers. As someone who has been around the sport for awhile, any thoughts on the recent increase in very young ultrarunners? One recovery topic that has always interested me is the long term effects of ultras in the heat and/or where rhabdo is involved. We can obviously train and adapt our physiology to run in the heat, but do you end up with long term maladaptive effects from races with heatstroke, rhabdo, etc? Thanks for the great tips and insights!